Background: Uterine arteriovenous malformation is a rare but potential life-threatening source of bleeding. A high index of suspicion and accurate diagnosis of the condition in a timely manor are essential because instrumentation that is often used for other sources of uterine bleeding can be lead to massive hemorrhage. Case: We describe here a case of uterine arteriovenous malformation. 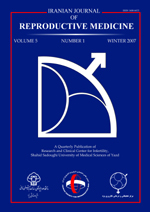 A 32-year-old woman presented abnormal vaginal bleeding following the induced abortion. A diagnosis of uterine arteriovenous malformation made on the basis of Doppler ultrasonraphy was confirmed through pelvic angiography. The embolization of bilateral uterine arteries was performed successfully. Conclusion: Uterine arteriovenous malformation should be suspected in patient with abnormal vaginal bleeding, especially who had the past medical history incluing cesarean section, induced abortion, or Dillation and Curethage and so on. Although angiography remains the gold standard, Doppler ultrasonography is also a good noninvasive technique. The transcatheter uterine artery embolization offers a safe and effective treatment. Uterine arteriovenous malformation, Doppler ultrasonography, Angiography, Therapeutic embolization.